One of the attractive features of the Ambrosian liturgical tradition is that it provides such an amazing abundance of prefaces – a proper preface for practically every proper Mass. This is in complete contrast, of course, to the Roman liturgical tradition, which historically featured only a very small number of prefaces. In fact, from the 11th Century until 1919 there were only 9 “proper” Prefaces in the Roman rite – Christmas, Epiphany, Lent, Passion Time (Holy Cross), Easter, Ascension, Pentecost (Holy Spirit), Holy Trinity (also used on all Sundays without a proper Preface of their own), and the Blessed Virgin Mary. The “common” Preface was used on all other occasions. (There was also a proper Preface in the Missa Sicca for the Blessing of Palms on Palm Sunday.) Then suddenly (a sign of things to come) 4 more new prefaces were added in the early 20th Century - the Preface for the Dead (1919), taken from the 1738 neo-Gallican Paris Missal, and the Prefaces of Saint Joseph (1919), Christ the King (1925), and the Sacred Heart (1928), all of which were new compositions. Then came the Pal VI Missal, which revised some existing Prefaces and added a great many more, bringing the total of available prefaces to over 80. The Roman Missal’s traditional paucity of prefaces and their stylistic restraint reflected the simplicity traditionally associated with the Roman Rite – in contrast to the more exuberant liturgical style of the neo Gallican and, even more so, the various Eastern Rites. For better or for worse, the post-conciliar Roman Rite has abandoned some of that simplicity and restraint. The expansion of the Lectionary, one of the few post-conciliar reforms which was actually specifically mandated by the Second Vatican Council, has been, I believe, an overall benefit to the Church. Likewise, the inclusion of additional eucharistic prayers, while certainly not intended by the Council (and which probably would have been voted down by the Council Fathers if the issue had come up) has also, I believe, been of benefit to the Church, despite the unfortunate and widespread over-use of of the very unsatisfactory Eucharistic Prayer II. So, if anyone were to ask my opinion (which, of course, no one will), I would recommend that the next edition of the Missale Romanum include even more additional prefaces, specifically more "proper" ones for individual saints - not novel compositions but drawn from the existing treasury of prefaces provided for us by the Ambrosian Missal. 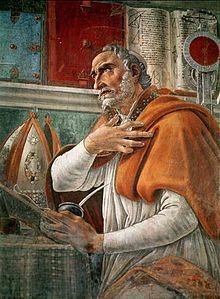 But back to Saint Augustine, whom Henri Marrou once famously suggested is one of the few Christian thinkers whom modern non-Christians might still take somewhat seriously. There is, of course, so much to admire and assimilate in the teaching of Saint Augustine. Consider, for example, his expansive treatment of friendship - an important theme in ancient thought, which we would do well to recover in contrast to our contemporary experience of increasing individualism and isolation. .
Necessities in this world amount to these two things: well-being and a friend. these are the things which we should value highly and not despise. well-being and a friend are goods of nature. God made man to be and to live; that's well-being; but so that he shouldn't be alone, a system of friendship was worked out. So friendship begins with married partner and children, and from there moves on to strangers. But if we consider that we all have one father and one mother, who will be a stranger? Every human being is neighbor to every other human being. Ask nature; is he unknown? He's human. Is she an enemy? She's human? Is he a foe? He's human. Is she a friend? Let her stay a friend. Is he an enemy? Let him become a friend. (Sermon 299D, 1, tr. Edmund Hill, Saint Augustine, Essential Sermons, ed. Boniface Ramsey, 2007). I have said probably everything I have to say about the eclipse (wonderful as that experience was), but there was something in people's behavior - including mine, let me hasten to admit - that is worth commenting on for its relevance to something significant in our liturgical lives, as we experience the dynamic interplay of anticipation and festivity in this society. I noticed it myself on Monday and even made the same liturgical-cultural analogy. I am sure others did too. 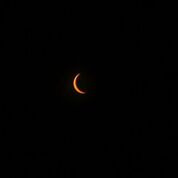 Since then, I came across this posting by Bruce Morrill at Pray Tell:, "Watching People Watch (Then Not Watch) the Eclipse: A Liturgical-Theological Reflection." "As I resumed switching between viewing the lunar movement and crescent aura through my glasses and taking them off to view the changing lunar-and-crescent shadows on the ground (utterly beautiful), I noticed people were immediately and then continuously walking away. ... The “after” period offered a precious several more minutes for seeing a crescent expand in the opposite direction. Yet that phase of the event was unable to sustain the attention of but a few. Totality had come and gone, and with it, most people." "The phenomenon aroused a thought about liturgical time-keeping that has been with me now for many years: My fellow Roman Catholics — but also, at least, other “Westerners” who practice the Liturgical Year — annually demonstrate genuine fervor at the beginning of Advent and then Lent’s beginning with Ash Wednesday. Popular or liturgical forms of engagement ensue, to varying degrees, up to the evening of December 24th or Easter Sunday Morning. 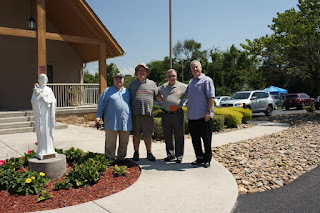 But then it’s all over, not only for the vast majority (including those who only join the liturgical assembly two days per year) but even for so many of the clergy and regularly attending laity." If any single cultural phenomenon is to blame for this, then my guess would be that it is the American Christmas (which has now spread all over the world). Christmas in the United States begins on Thanksgiving (and increasingly earlier) and continues with weeks (months?) of shopping and celebrating culminating on December 25, and then it is over. Already on December 26 the first thrown-away Christmas trees can be seen as trash in the street. Catholic churches do typically keep their poinsettias in place another week or more. but this somewhat counter-cultural gesture is less and less coherent not only with what is happening in the society outside but even within the Church, where in many laces the Christmas Octave is increasingly treated not as a major feast but as a time for vacation. Even worse, the obsession with anticipating the feast increasingly sees December 24 becoming the principal celebration, with Christmas Day itself poorly attended. Easter Sunday morning is probably still the best attended day of the year in most churches. but, as Morrill notes, the notion that Easter stretches on for another seven weeks is increasingly hard to sustain. "theological-anthropological observation ,,, that the apparently open-ended, indefinite character of the Paschal Mystery makes the Easter Season (and to its lesser extent, Christmastide) difficult to celebrate vigorously over many weeks. In contrast, Advent and Lent each have such a tangible, timely goal, perhaps a moment of totality, lending themselves to heightened anticipation and countdown-able preparation. .... The (perhaps unsettling) challenge of the Fifty Days of Easter, in contrast to the Forty Days of Lent, is to receive and live them not as a denouement but as a revivifying, empowering, sacramental-ethical eschatology." That may well be. But the point, of course, of which our behavior after the total eclipse is but one more illustration, is that we seem as a society to have become culturally incapable of sustaining such a sensibility as our liturgical calendar calls for. Our attenuated attention-spans are reflected in our worship in all sorts of ways, not least in this increasing bowdlerization of the annual liturgical cycle of seasons and feasts. Blow the trumpet at the new moon (Psalm 81:3). No one blew a trumpet for this New Moon. The Moon did it herself, as she put on a show of shows, covering up the Sun in an amazing spectacle of light and shadow. 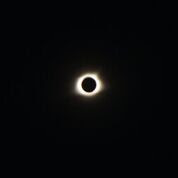 Since Knoxville was just outside the path of totality, the four of us drove down to the southernmost parish in our deanery - scheduled to be more than 2 minutes in Totality - to view the eclipse from there in all its amazing grandeur. We were not alone. We left in mid-morning, hoping to avoid getting snarled in traffic and so got to the city of Madisonville (2010 Population 4,577) around 11:00 which left us plenty of time to get some lunch in a crowded roadside restaurant with some of the other "eclipse tourists" who were swelling the town's population on this so memorable day. Then on to the church, where we met up with others we knew from other parishes around and others who had come from as far off as Mexico and Queens, NY, to experience this awesome spectacle. Children were playing games. People were cooking food in the parking lot and picnicking on the grass. It was a real party atmosphere. Everyone was friendly and hospitable, inviting others to share their food. I have never been to a "tailgate," but my guess is that this was a somewhat similar, but probably somewhat more relaxed experience. Nice too, of course, was having an air-conditioned church building to take refuge in from the heat! As I say almost everyday, "Thank God for air-conditioning!" After making a proper visit to the church itself upon arrival, I periodically retreated to other open parts of the building to sit down, cool off, and reflect upon what we were witnessing. The first part of the eclipse went on for over an hour. The Moon bit more and more into the Sun, which itself as a result came more and more to resemble a kind of crescent moon! The effect of wearing the special eclipse glasses was startling! Unlike wearing sunglasses, for example, when wearing the special eclipse glasses you could see nothing at all, total darkness - except for the sun, which looked like a small yellow disk, getting progressive smaller as the hour passed. If you didn't know what you were looking at, you might think you were looking at the night sky at one of the partial phases of a harvest moon. Towards the end of the Moon's apparent conquest of the Sun, you could feel the difference in the air, as it got just a little bit cooler. You could see the difference in the sky as it started to get darker. 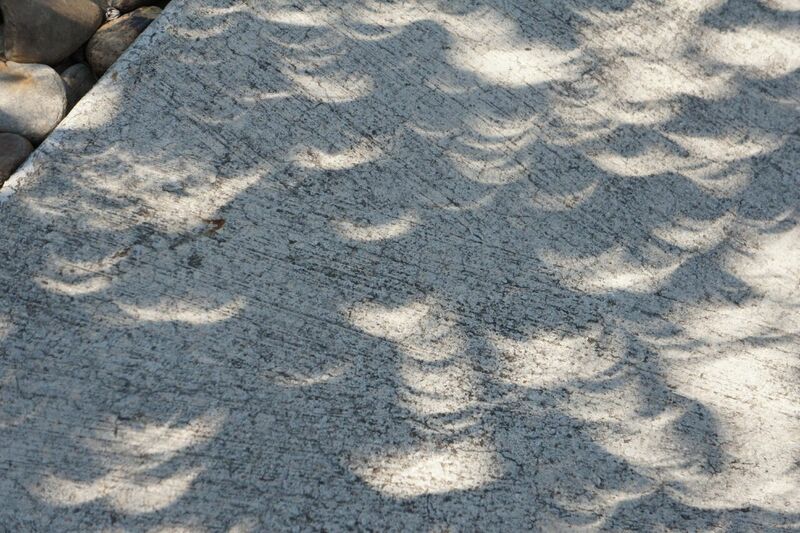 You could see it on the ground, which as it were reflected the crescent sun in patterns on the ground. Soon it seemed like an eerie twilight. We could hear the animals reacting accordingly, as if imagining it must be sunset. And then it was dark! Two or three stars appeared in the sky, as the sun was completely covered and its hot corona suddenly shone all around the dark disk of the Moon. People cheered. People prayed. And then it was suddenly light again. No sooner did the Moon's movement reveal a small sliver of the Sun (on the other side this time), then normal light started to return. I suppose the poor animals were completely confused, as well they might be. We, however, who understood what we had seen and experienced could but express our joyful admiration. The Commission considered various titles - Regina mundi, Regina coeli et terrae, Regina ecclesiae, Regina universi - finally settling on Festum B.M.V. Reginae. Various dates were considered for the new feast. In the end, the Commission proposed May 1 (although that would necessitate moving Saints Philip and James from their traditional date). On September 8, 1953, in the encyclical Fulgens Corona, Pope Pius XII proclaimed the first-ever "Marian Year" to commemorate the centenary of the dogmatic definition of the Immaculate Conception. 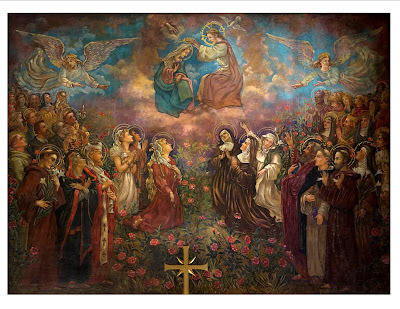 Then, during that same "Marian year," on October 11, 1954, another encyclical, Ad Caeli Reginam, proclaimed the Queenship of Mary and assigned the new feast to May 31. 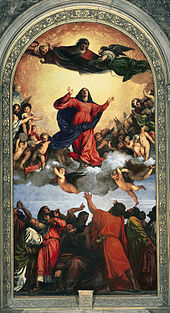 Paul VI's post-conciliar reorganization of the Roman Calendar reduced the feast to a "memorial" and transferred it to August 22, the (suppressed) Octave Day of the Assumption. August 22 had also been considered back in the 1950s. (Pope Pius XII had earlier assigned the feast of the Immaculate Heart of Mary to that date. Paul VI's calendar would likewise lower its rank and reassign it - to the Saturday after the Sacred Heart.) Yet the logic of linking Mary's Queenship to the Assumption seems immensely obvious. It seems to confirm the notion that feast of Mary's Queenship would highlight her ongoing intercessory role in the fullness of her heavenly glory, which, while implicit in the celebration of the Assumption, risks getting under-emphasized in the Assumption's primary emphasis on Mary's bodily glorification. The latter emphasis is important eschatologically. In the daily life of the Church, however, Mary's ongoing intercessory role in the fullness of her heavenly glory is certainly as immediately significant. 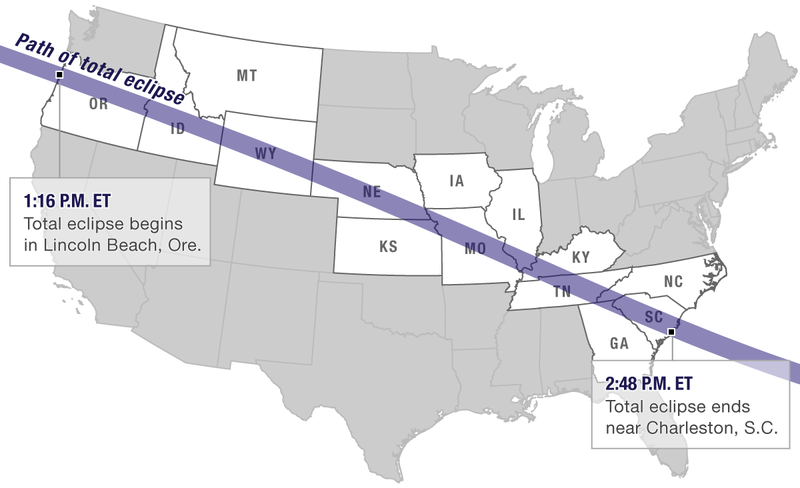 Are we all ready for the “Great American Total Solar Eclipse”? Solar eclipses have fascinated people for all of human history. So it is no surprise that this eclipse is attracting scientists and eclipse tourists to our neighborhood from all over the world, and the US Postal service has even issued a special commemorative stamp! 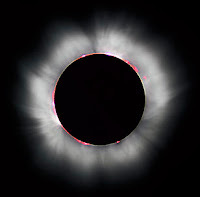 Historians have long been fond of eclipses, since historical references to ancient eclipses sometimes enable other ancient events to be dated more precisely than would otherwise be possible. One of the earliest known solar eclipses was in 1375 B.C. and was recorded in the ancient city of Ugarit, in what is now Syria. (Syria always seems to be in the news!) In earlier times, eclipses were often interpreted as signs or omens of some contemporary calamity. They have also been known to alter behavior. Thus the ancient Greek historian Herodotus wrote that an eclipse that occurred during a battle between the Medes and the Lydians in 585 B.C. caused the two armies to stop fighting and make peace. Wouldn’t it be something if tomorrow’s eclipse had that kind of effect on any of the conflicts currently tearing our world apart! What will be the impact of this eclipse on us? How will we experience it? What will we take away from what for most of us will be a once in a lifetime experience? The Gospels don’t record any eclipses. It was no natural phenomenon, but another person - a foreigner - that challenged Jesus and his disciples in a fundamentally important way in the gospel story we just heard. Actually, since the story is set in Gentile territory, it was really Jesus and his disciples who were the foreigners there. In this, the event anticipated the reality of the Church, a house of prayer for all peoples, in which we are all in some sense foreigners in the world but no longer foreigners to one another. The perseverance of the Canaanite woman, a descendant of Israel’s ancient enemies, overcame the historical legacy of cultural and religious segregation. Her prayerful persistence shattered Jesus’ silence, and he in turn responded to her great faith. Hearing this story, the founding generation of Jewish Christians could recognize and celebrate – as we all must - the unique and special mission of God’s Chosen People, Israel, for, as we just heard Saint Paul instruct the Romans, the gifts and call of God are irrevocable. At the same time, generations of Gentile Christians, beginning with those Romans Paul was writing to and continuing generation after generation down to us, must recognize ourselves in the Canaanite woman and her daughter, united by faith in a new People among whom we are all immigrants but may no longer be strangers, segregated from one another. That was a powerful lesson, a defining and transforming experience for the first generations of the Church, Jews and Gentiles alike. It continues to challenge us as foreigners who join themselves to the Lord to become that house of prayer for all peoples, not as some vague aspirational slogan but as the very heart of the lived reality of what it means to be the Church in a divided and conflicted world. It is an important reminder that all the identities that divide the human family – such as racial and national identities – are part of our fallen human condition, not part of the natural order as created by God, and that they have been decisively overcome and replaced for Jesus’ disciples by a completely new concept of community, to which we owe our primary allegiance. Like the many who come from far and wide to experience the awesome wonder of the eclipse, we are all pilgrims seeking the light revealed amid the dark shadows of our day-to-day divisions and conflicts. That light is revealed not in natural phenomena but in the experience we share with the Canaanite woman and her daughter, strangers no longer either to one another or to the Lord who heals and saves us. Homily for the 20th Sunday in Ordinary Time, Immaculate Conception Church, Knoxville, TN, August 20, 2017. Of course, from the late 18th-century British point of view, Washington, Jefferson, Madison, Monroe, and the rest of our "Founding Fathers" were traitors too. 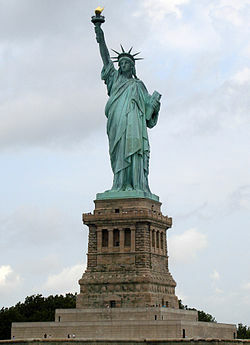 It would certainly have been odd for anyone in Britain to have erected statues in their honor! On the other hand, Britain accepted and recognized American independence in 1783, and the two nations made peace and established ordinary diplomatic relations, and even eventually (much later) became close allies. I don't know of any British statues of George Washington, and we all know that King George III's famous statue in New York City was never restored. But such monuments, if eventually erected or restored, would presumably have been seen as acts of mutual reconciliation between former enemies now allies - again not necessarily as endorsements of everything those individuals did in life. Magnanimity in victory is a virtue. But real reconciliation between former enemies is always a two-sided process. In the 20th century, Germany and Japan recognized the reality of their defeat and accepted the fact that they had surrendered - and they altered their behavior accordingly. The erection of Confederate statues and monuments in the late 19th and early 20th centuries, however, was the exact opposite. It was a defiant demonstration of non-acceptance of defeat and surrender. 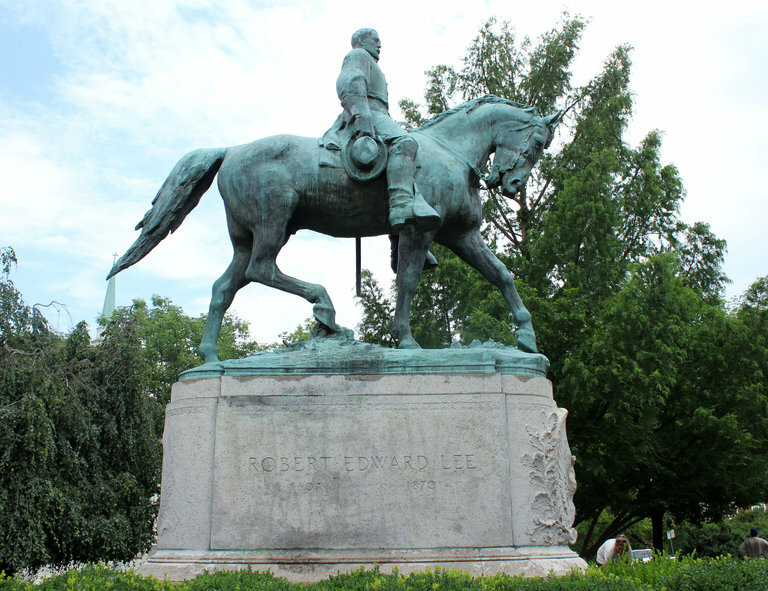 That statues of Robert E. Lee and Jefferson Davis were eventually erected even in the U.S. Capitol (despite strenuous protests at the time) demonstrates the complicity of the Federal Government in permitting the perpetuation of Confederate ideology - more importantly and tragically through its failure to enforce the 14th and 15th Amendments to the Constitution. Had those Amendments been enforced, history would have been very different, and we would not as a nation be in the situation we are today. Even now, the enforcement of those Amendments is not what it was intended to be - witness the Supreme Court's evisceration of the 1965 Voting Rights Act in Shelby County v. Holder (2013). The refusal of many to respect the result of the Civil War and the passive complicity of many others (not to mention the cynical "Southern Strategy" employed by President Nixon and continued by his party) have resulted in a polarized society so divided by mutual hatred and incomprehension that progress on almost any front - let alone real national reconciliation - seems beyond our ability as a nation. One small step, however, would be the elimination of those statues and monuments whose very purpose has been to legitimize that polarization by honoring and celebrating slavery and treason. Effectively accomplished, that one small step might become the giant leap our nation needs so desperately to begin the work of national reconciliation and reconstruction. Among the Saints and Blesseds traditionally listed in the Roman Martyrology on August 18 is Saint Helena (244-330). Her entry in the Martyrology for today reads: At Rome, on the Lavican road, St. Helena, mother of the pious emperor Constantine the Great, who was the first to set the example to other princes of protecting and extending the Church. The Martyrology says more about Constantine than about Helena (an occupational hazard, perhaps, when your son in an emperor). At least the Latin Church accords her a day of her own. 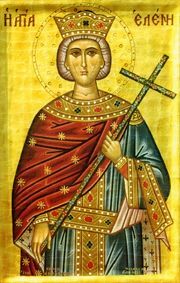 The Eastern Church celebrates her jointly with her son on May 21, the "Feast of the Holy Great Sovereigns Constantine and Helen, Equal to the Apostles." Obviously, Helena was able to accomplish all that she did identifying historical sites and relics in Israel because of who her son was. So perhaps it is only fair that she share her honor with him! That said, she is certainly a historical personage in her own right. To the rescue, so to speak, came Catholic convert and 20th-century British author Evelyn Waugh (1903-1966), who published Helena, his only explicitly historical novel in 1950. Waugh himself considered Helena his best work - an opinion not widely shared among literary critics and students of Waugh.I was introduced to Helena a decade or so ago when we read it as part of our monthly "Great Catholic Fiction" book club at Saint Paul the Apostle parish in New York. I thought it was an OK book, but at best one of Waugh's minor works. Brideshead Revisited it most certainly is not!. Waugh's Helena draws on the medieval tradition that she was an ancient British princess, a daughter of King Coel ("Old King Cole"). The novel displays some of the humorous satire for which Waugh was so well known, but does so less memorably than some of his more famous works. One aspect of the book which I think especially worthy of mention, however, is how it captures the characteristic vanity and ambition of the imperial court and the persistence of murderous palace intrigue, notwithstanding conversion to Christianity. There are tendencies in some quarters to over-interpret social and political events in pseudo-religious terms. Nowhere has this been more ridiculously evident in recent years than in the bizarre notion that President Trump is a kind of Constantine figure, appearing on the political scene as the providential protector of Christianity. (See, for example, Blaise Joseph, "Is Trump the New Constantine," https://www.mercatornet.com/articles/view/is-trump-the-new-constantine/17800). The analogy can be faulted on various counts - not least the fact that secular "political correctness," while problematic in so many serious ways, does not really represent a threat to Christianity comparable to that posed by Constantine's Christianity-persecuting predecessors! Indeed, as the events of this past week have highlighted, an obsessive opposition to "political correctness" may miss more pressing political and moral evils that also need to be forcefully opposed. But, be that as it may, Waugh's depiction does demonstrate the inevitable limits not just of Constantine the actual historical emperor but of the whole enterprise of making religion an adjunct of political power - which has probably been the most consistent contemporary failing of the American "religious right." Sun and Moon, Bless the Lord! I was saddened to hear yesterday on NPR that the moon is slowly moving away from the earth. Every year, it seems, it shifts outward about an inch-and-half. That means that, in only about another 600 million years, the moon will look small enough that it no longer completely covers the sun, and whoever is left on Earth then won't see any more total solar eclipses! So aren't we lucky to be living on earth now! 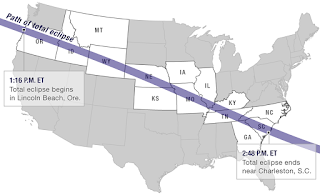 Monday’s eclipse is being called the “Great American Total Solar Eclipse,” since the 70-mile-wide shadow cast by the moon will darken skies from Oregon to South Carolina, The total eclipse be first visible in the continental United States on the Oregon coast and will progress south-eastward across the country, covering parts of Tennessee in its shadow. Meanwhile, more people may be congregating in some small towns in the path of totality on Monday than in all of history hitherto! President Obama was famously fond of quoting: "The Arc of the moral universe is long but it bends toward justice." The logic of this slogan is further reflected in secular liberalism's somewhat bizarre preoccupation with always being on something it curiously calls "the right side of history." Sadly, however, history has no "right" side. History just happens. Like human nature itself, our morally imputable, human, historical actions have teleology, but history itself does not. History is just what we do - both good and bad, both right and wrong. As Jesus said, Watch out that you are not deceived. All sorts of things may happen in history. But the end will not come right away (Cf. Luke 21:8-9). Secular fantasies about being on "the right side of history" may be one more casualty of the political and moral crisis that has gripped our country. The recent resurgence of publicly celebrated, racist Confederate and neo-Nazi displays, such as was seen in Charlottesvlle last weekend, illustrates the amorality of history's direction. It can go any way - right or wrong. It's really up to us which way it goes. Again, history is what we do. It is we - not some impersonal abstraction called history - that can do right or wrong. It is neither accidental nor inconsequential that the public celebration of Confederate and neo-Nazi values in Charlottesville last weekend was connected to a present-day controversy about removing a statue of Robert. E. Lee (photo). A disinterested observer would ask the obvious question. What kind of society tolerates statues and other monuments in honor of traitors? The fact that Robert E. Lee and others were not tried, convicted, and executed for treason (as defined in Article Three of the US Constitution) is past history, with consequences in the present Contemporary cults that continue to honor them, however, are among those consequences. This is present history and so is as yet unsettled and is for those alive now to settle. Statues are in themselves simply symbols. But a contemporary generation which witnessed the removal of Communist-era statues after the fall of the Soviet Union understands the potent significance of such symbols - symbols that may portray the past but speak in and to the present. Only when all vestiges of the worst of American history - i.e., of the Confederate fight against the United States in order to preserve and perpetuate slavery - have finally been consigned to the past by people in the present, only then will this nation begin to build not some imaginary utopia on "the right side of history," but the more modest but also more attainable goal of at least a better, more humane, and more just society. History's only actual arc is the one we set for it by what we do in present history. So let us do the challenging and demanding work of resetting that arc so as to pass on to the future a country that may be - in the words of the so-called "Ephebic Oath" - "not only not less, but greater, better, and more beautiful than it was transmitted to us." To an ancient Christian audience, already well acquainted with the Old Testament, the identity of the woman in today's (to us somewhat strange-sounding) 1st reading [Revelation 11:19a; 12:1-6a, 10] would be obvious. She is Israel, God's Chosen People, bringing to birth the Messiah, thanks to whom Israel has been expanded now to include all nations and peoples in a new and enlarged People of God, the Church, which continues the task of bringing Christ into the world. Now that the Risen Christ has ascended to his throne in heaven, the Church remains behind, still suffering from all sorts of evils, but full of hope and confidence in the future. It is easy to recognize the story of the Church in the image of this woman - and equally easy to see her as a symbol of Mary, the mother of Jesus. In Mary's prayer in the Gospel we just heard [Luke 1:46-55], Mary united herself with God's actions on our behalf and so invites us to identify ourselves too with God's plan for the world. Part of that plan is our sharing in Christ's risen life. Christ, Saint Paul reminds us in today's 2nd reading [1 Corinthians 15:20-27], has been raised from the dead, the first fruits of those who have fallen asleep. In ancient times, the springtime offering of the first fruits signified the dedication of the entire harvest to God. So the resurrection of Christ (which took place on the day of the offering of the first fruits) points ahead to the final resurrection of all those who belong to Christ. In Mary's assumption, we have fast-forwarded to what God, having already accomplished in Christ, plans yet to accomplish in us. Assumed into heaven, Mary links the Church, as we are now, with the Church, as we hope to be then. But, meanwhile, we are still surrounded on all sides by so much bad news. Our world is full of natural and human-made disasters - domestic terrorism, foreign war, economic exploitation, once stable societies unravelling, and once-trusted institutions breaking down, as well as inexplicable personal tragedies. But God has already acted on our behalf by raising Jesus from the dead. In Christ, God has given us an alternative future. And, in Mary, Christ's resurrection has, so to speak, become contagious. In Mary's assumption, God has shown himself as her life and her hope - and so also our life and our hope. Today, Mary magnifies the Lord on high. She has already led the way for us in being there. May she now also show us how to get there. For where she is, there we hope to be. Homily for the Assumption of the Blessed Virgin Mary, Immaculate Conception Church, Knoxville, TN, August 15, 2017. The “Old” Catholic Encyclopedia (the first volume of which appeared over 100 years ago in 1907) identified the Assumption as Mary’s principal liturgical feast and assigned it “a double object: (1) the happy departure of Mary from this life; (2) the assumption of her body into heaven.” Thus, well before Pope Pius XII’s dogmatic definition of the Assumption in 1950, the Catholic Encyclopedia attested to the antiquity of the traditions which underlie the Church’s belief. The centerpiece of that grand event was, of course, the solemn papal proclamation of the Apostolic Constitution Munificentissimus Deus. Ecclesiologically, it is interesting how the Pope framed the process of preparing the definition – in particular the 1946 inquiry sent to the world’s bishops: “Do you, venerable brethren, in your outstanding wisdom and prudence, judge that the bodily Assumption of the Blessed virgin can be proposed and defined as a dogma of faith? Do you, with your clergy and people, desire it?” (MD 11). The almost unanimous response of the world's bishops affirmatively confirmed the traditional popular belief. Munificentissimus Deus is also especially interesting for the its appreciation of the role of the Church's liturgy in expressing the Church's faith. On this Assumption Eve, we may also wistfully recall the Pope's reference to how his predecessor Saint Leo IV (Pope 847-855), who built the defensive wall that still encloses much of the Vatican, "saw to it that the feast, which was already being celebrated under the title of the Assumption of the Blessed Mother of God, should be celebrated in an even more solemn way when he ordered a a vigil to be held on the day before it" (MD 19). Today's Vigil of the Assumption survived the “first cut” when various other vigils like that of the Immaculate Conception were axed in 1955. Among the most ancient vigils it manged to survive until the unfortunate final elimination of all vigils by Paul VI in 1969. For many people summer means time to head for the water – to swim, to sail, to ski, whatever. Twenty-four summers ago, when I was in Israel, a group of us went to great length to find a beach on the Sea of Galilee just so that we could all say that we had actually physically been in the water of the Sea of Galilee. Yet, while frolicking in the water has always had a broad appeal, there has also always been a certain dimension of danger associated with water. Jesus and his disciples undoubtedly understood that and treated their local waterway more seriously than we did. It was, after all, where the disciples had, until just recently, been making their living as fishermen; and it was still, so the Gospels seem to suggest, serving as a base of operations for Jesus and his disciples. And, like anyone who has ever been caught in a boat in a storm, they knew how very suddenly things can change and suddenly go very wrong on the water; and they likely also knew how limited was the security that their fishing and seafaring skills could guarantee. Today’s suggestive image of the disciples in the boat, being tossed about by the waves, with Jesus miles away praying on the mountain, has often been seen as an apt image for the Church. In the 3rd century, the Roman martyr Hippolytus (whose commemoration in the Church’s calendar actually occurs today) described the Church as a boat in a storm being tossed about by the waves of the world. Not much has changed in almost 2000 years! It still seems a very apt image for a Church forever struggling to hold its own amid the many stresses and dangers a perennially hostile world keeps throwing up at it. Anyone who keeps up with the news knows about the dangers and difficulties faced by Christian communities in the many parts of the word – in the Middle East and elsewhere. Compared to that, whatever difficulties we may experience seem like modest storms. But even ordinary storms can pose serious challenges. One of those in the boat – appropriately enough Peter, the one appointed by Jesus to be the leader his Church - was willing initially to take Jesus at his word. “Lord, if it is you, command me to come to you on the water.” As I said last week, Peter being Peter, typically says the right thing but then shows how completely clueless he is about what it means. And so Jesus generally both praises him for initially responding the right way and then reproves him for missing the point. As he typically does, Peter here blurts out the first thing that comes into his head - because his heart already belongs to Jesus. But then he loses his focus, forgetting, so it seems, exactly who has just called him to come, and instead starts seeing the danger, starts considering the costs, starts thinking the way the world thinks. And when we start thinking the way the world thinks, then the world starts to win. Peter’s faith is real, but it is what Jesus calls “little faith,” a fearful faith, a faith that still lets itself get distracted by the world, by other ways of thinking and being. And so he starts to sink. Like Peter, we are all susceptible to the competing concerns of other ways of thinking and being. We are tempted continually to count the costs of our commitment – and to try to measure its benefits. We seem forever caught somewhere between walking in faith and sinking in fear. So we are perpetually in need of that outstretched hand, which catches us in spite of all our fears, the hand of the Risen Christ, who has promised to remain with us in this boat, which is his Church, forever. Homily for the 19th Sunday in Ordinary Time, Immaculate Conception Church, Knoxville, TN, August 13, 2017. We are, as we have been taught to say over and over, a "nation of immigrants." So you would think, given our national experience as a "nation of immigrants," that we would be well positioned to get immigration policy right. There is, alas, plenty of evidence to the contrary. Indeed, it seems to be one of the harder issues for us to resolve - rendered, if anything, even more so by our present political dysfunction. Even so, our actual national experience should serve to illuminate for us a better path to follow. I say better path, rather than best, because our experience also teaches us that there is no one obviously best solution, that any policy has its pluses and its minuses, and that any policy inevitably benefits some people more than others. Immigration has been part of the human story from its beginning. In elementary school, when we studied the fall of the Roman Empire, it was largely portrayed as the result of ... immigration! There was some oversimplification in that account, but it reminds us that the Europe we are now so familiar with is itself the result of long-ago population movements. But in Europe that process has resulted in states which are now largely national in composition, in which common ancestry, common language, and common religion have largely formed those societies' common bonds. Such states can and do assimilate outsiders, but often awkwardly, sometimes with great difficulty, and most easily in smaller numbers - as the contemporary divisions in Europe over immigration have reminded us. Somewhat differently, our American history has produced a more multi-ethnic society which has relied on a common civic (rather than ethnic or religious) culture as the glue to hold itself together, while our unofficial but de facto common language has over time helped to serve as one of the instruments of assimilation. Yet immigration in the United States has never been without its difficulties. Newcomers - especially newcomers in large numbers and newcomers from newer places - have often been seen as a challenge to American society's capacity (and willingness) to assimilate them. Still, over the long-term, immigration has been a success. The public school system deserves a special word of praise for its role in forming a common civic identity, which over time different ethnic and linguistic groups have found it possible to identify with and assimilate to. Like so many baby boomers, I am among the grateful 3rd-generation beneficiaries of the great wave of immigration in the late 19th and early 20th-centuries. There can be little doubt that our country is significantly better off for having received so many new immigrants from so many new places during that period. There can also be no doubt that at the time it put some strain on American social cohesion and national self-understanding, and so was not universally well received. One result was the restrictive immigration system put in place in the 1920s and that remained in effect until 1965. That national origins quota system obviously kept many out who would have benefited from coming to America and from whose contributions America would in turn have greatly benefited. Certainly, in trying to freeze the ethnic map of the country it was manifestly unjust to southern and eastern Europeans (among others). On the other hand, that 40-year immigration pause perhaps eased the process of assimilation for the many immigrants who had already arrived and for their 2nd generation. In the process, it may have helped stabilize society in a way that served the country well during the cataclysmic crises of the Depression and World War II. So, again, the lesson is that every actual arrangement has its individual winners and its individual losers and its overall benefits and overall challenges for society as a whole. By the 1960s, it had become increasingly evident that the disadvantages of the national origins quota system now obviously outweighed any of its benefits, and American society was again ready for a change. Not unlike the situation a century ago, recent decades have brought many more newcomers to our shores. This has, on balance been an overwhelming benefit, but it has also been a challenge. The Immigration issue is not unlike free trade, which brings great benefits for many, but suffering for some. Elites who have benefited from globalization largely favor free trade. Those left behind by it have reacted differently. Hence, the current "populist" resurgence both in the United States and in Europe. David Goodhart, the British author of The Road to Somewhere: The Populist Revolt and the Future of Politics. distinguishes between "Anywheres" and "Somewheres." The "Anywheres" (who he estimates are roughly a quarter of the UK's population) are more highly educated, more mobile, predominantly urban, socially liberal, globalists. The "Somewheres" . (who he estimates are roughly half of the UK's population) are generally less well educated, rooted in their families and local communities. more socially conservative, and more committed to and invested in family, locality, and nation. That is, I think, likewise a good description of much of the class and cultural divide in the United States, which already preceded the last election but which that "Make America White Again" election so dramatically highlighted. On the immigration issue, both American "Anywheres" and American "Somewheres" may have valuable insights into the relative advantages and disadvantages of alternative approaches to future immigration. Somehow, they have to find a way to listen to each other and incorporate each other's insights - and specific group interests - in a comprehensive solution that goes beyond unrealistic, ultra-left-wing sloganeering about totally open borders and narrowly chauvinistic, right-wing sloganeering about building walls. Our current incapacity even to attempt this is, of course, yet one more illustration of how completely dysfunctional our polarized politics has become. “Shut up and listen!” How many times did our parents and teachers tell us that when we were kids! Peter, James, and John are kind of like children in this story – excited by what they are experiencing, but for the moment quite clueless about its meaning. Later in life, Peter will in turn instruct us to be attentive to the message in this story, but, before he could do that, he had to learn that lesson himself – as we all must. According to Saint Matthew, Jesus was transfigured just six days after he had famously put his disciples on the spot by asking them, “who do you say that I am?” Peter had spoken up on that occasion too. And, Peter being Peter, he gave the right answer but then showed how completely clueless he was about what it meant. And so Jesus both praised him for giving the right answer and then reproved him – called him Satan in fact – for missing the point. Presumably Jesus intended his transfiguration to reinforce the lesson he was trying to teach. In our electrified world, we have little experience of true darkness. But, if and when we do, we suddenly appreciate the effect of a light shining in the dark. Think of that scene in the movie Titanic, for example, when the traumatized survivors, sitting in their little lifeboats in the dark ocean, suddenly see the light of a rescue ship on the horizon! Like Peter, we can all easily hear Jesus through the filter of our preconceptions and preconditions. The challenge is to cut through all that, to let go of all that, to experience God’s presence and action in our lives in Jesus as unfiltered as that rescue ship’s light appeared in the dark North Atlantic. Listening like that then becomes the life-transforming experience it eventually became for Peter and is intended to be for all of us. And who knows? Our lives having been truly transformed by Christ, we may even start seriously listening to one another as well. And wouldn’t that transform the world! 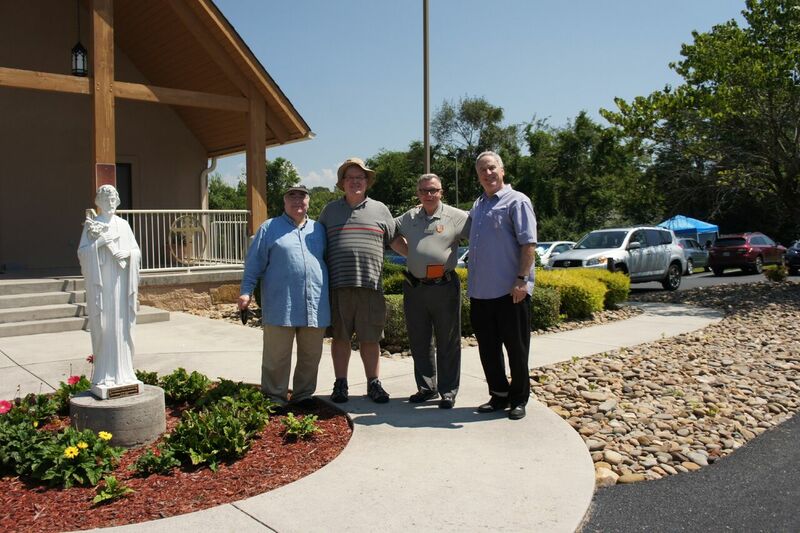 Homily for the feast of the Transfiguration of the Lord, Immaculate Conception Church, Knoxville, TN, August 6, 2017.